The whole tire/wheel sizing thing got to be real complicated for this build. At this point we’re looking at a set of 18 inch wheels and needed to do some preliminary sizing work. 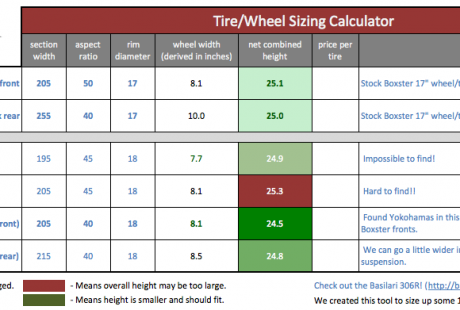 So, after an hour or so tinkering around in Excel we came up with the attached tire/wheel sizing calculator tool. You can put in a target size at the top and then try to “solve” for your tire/wheel combination. So we’ve got the rough dimension work out of the way but we’re still going to need to determine our optimal offsets and such. Tire-sizing-sheet Tire/wheel sizing calculator (Excel). This could help some other build projects out there. If you find it useful, let us know and we’ll link to your project!